Crazy good invites keep finding their way into our inbox, like the one we got from Gilt City! Who knew we were cool enough for the people behind Gilt to email us?! (Hi, guys!!) (Speaking of, if anyone wants to throw this my way, I am down. I'll even take you with me.) 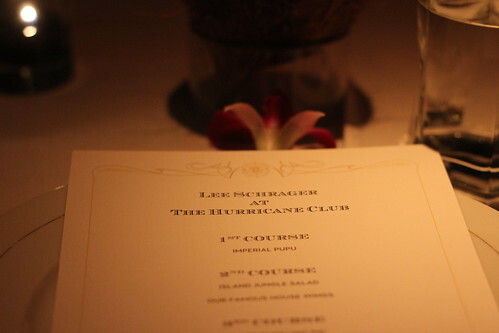 Well, the invite was to eat dinner at The Hurricane Club with Lee Schrager, the man behind the Wine & Food Festival curtain. 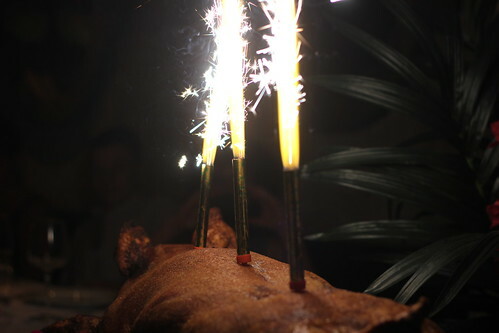 Drinks in coconuts, roasted pigs, and roman candles?! This is an easy one, folks. I don't know if this is true for all of Gilt City's dinners, but this one involved eating a bit separated from the dining floor, communal style with complete strangers. This is actually something Brownie and I have come to love since you can meet new people and it tends to get really friendly very fast. That said, it's not for everyone and does require some seating forethought. Speaking of getting friendly, the dinner included two boozy drinks--almost everyone went for their signature #77 aka the drink in the coconut. It's fun drinking out of coconuts. 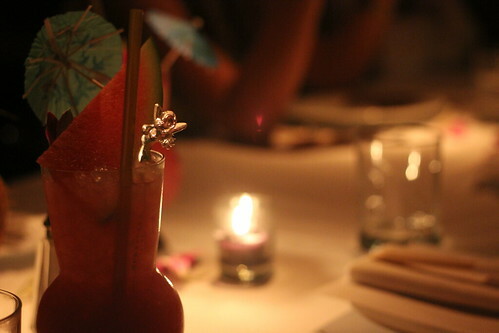 Their other tiki drink offering, the Hibiscus Sling, offered up boobies and Cristal, just our style. 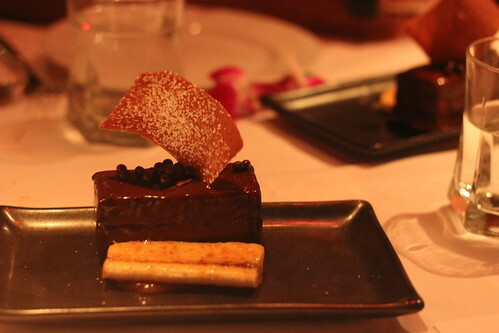 The dinner's three courses involved a variety of menu offerings. The Imperial Pupu platter, house wings, jungle salad, all sorts of delicious tiki dishes. But the main attraction of the night was a 30 pound roast suckling pig. 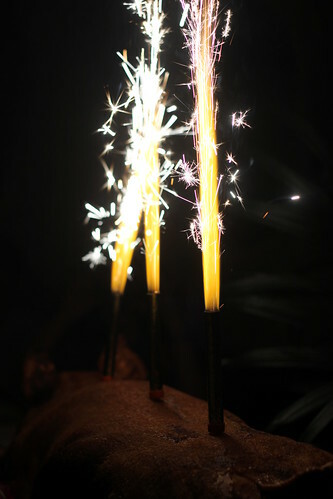 That was presented to us with three roman candles aka THE BEST WAY TO EVER PRESENT YOUR DINNER! (Big Bobo has since ixnayed having roman candles at Thanksgiving, something about fire hazards.) After de-candleing the piggy was butchered into square chunks, most with a thick layer of the perfect crispy cracklin skin still attached. Sweet dreams will be made of this pig. It was so incredibly tender and juicy, it caused both of us to immediately begin considering having a group meal here. The sweet end of the meal could never live up to that third course. Nothing can. This was a decadent slab of devil's food cake sandwiching a layer of cream before being covered with melted chocolate. We diligently ate it, and wished we had asked for doggy bags of the pork. Instead, we might have taken home a couple of desserts.